It’s not always obvious when, or how, to ask for a raise. Educating yourself so that you can formulate a strategy will result in a better outcome than going in blindly and winging it. Although sometimes the response to a request for a raise is going to be a “yes” or “no” regardless of how you construe the question, properly preparing before you make your proposal can vastly increase your chances of success. Here’s a list of the top 10 dos and don’ts when it comes to asking for a raise. 1. Ask after a big accomplishment. So you just scored a deal or landed a big sale? It’s a good time to ask for a pay raise. Capitalize on the momentum of your success, and you may find yourself in an ideal position to ask for a salary increase. 2. Write, and rehearse, an agenda. Don’t walk into your meeting empty-handed, and without having prepared beforehand. Brainstorm a list of concrete reasons as to why you deserve a raise, write them down, and rehearse them to ensure a confident and convincing delivery. In addition to listing your accomplishments, you may also want to mention a recent expansion in your responsibilities at work, additional tasks you’ve taken on, new strategies you’ve adopted, projects you've spearheaded, and any plans you have to further increase your department’s success. You may also want to consider typing up and printing out a copy for your boss, so they can look it over and discuss with other supervisors if necessary. 3. Time your request accordingly. Familiarize yourself with your company’s review policy. Do they carry out performance reviews every three months? Every six months? Every year? Discretely discuss with your co-workers, or consult with your human resources department to get a sense of the timeline. If possible, you should also try to align your request with the company’s financial trajectory. Try asking when new funding is coming in, when the new fiscal year is starting, or when you think your employer could easily factor in an increase in pay. 4. Dress the part. Even if your office dress code tends to be lax, when it comes time for your meeting, you should look the part. Take those few extra minutes to put on a tie, iron your blouse, or pull your dress shoes out of the closet. Although you don’t want to look like you’re trying too hard, looking polished and professional can’t hurt, and will only help you feel more confident as you make your case. 5. Have other options on the back burner. No one wants to hear “no” for an answer, but a rejection can present an opportunity to make another proposition. Do you want to inquire about working from home one day per week? Are you in need of a new mobile phone or laptop for your work purposes? Is there a conference or industry event you’d like to attend? Your boss may be more likely to say “yes” to a smaller request after saying no to a big one. 6, Don’t ask via email. Although it’s acceptable to schedule a meeting via email, you really should have the conversation about getting a raise in person. It’s the best way to show that you’re serious, and will also allow you to gauge your boss’s reaction to your request. Just send your boss an email, or ask in person, when they might have a block of time free to discuss a question regarding your salary. You might even see if they are available for a lunch meeting, which can be a good setting to have a conversation. 7. Don’t ask at a high-stress time. Use common sense when you approach your supervisor about the possibility of a raise. If your boss is particularly stressed and overworked, it’s probably not the best time to bring up the topic. If you can, wait it out and ask during a lull, or at least when you see that your supervisor is in a good mood. 8. Don’t give an ultimatum unless you’re willing to lose the job. Be careful about how you broach the topic. You don’t want to come across as too harsh or demanding. Of course, be confident and assertive in your request, but be aware of your tone and focus on being patient, professional, and understanding. Use caution with how you negotiate. 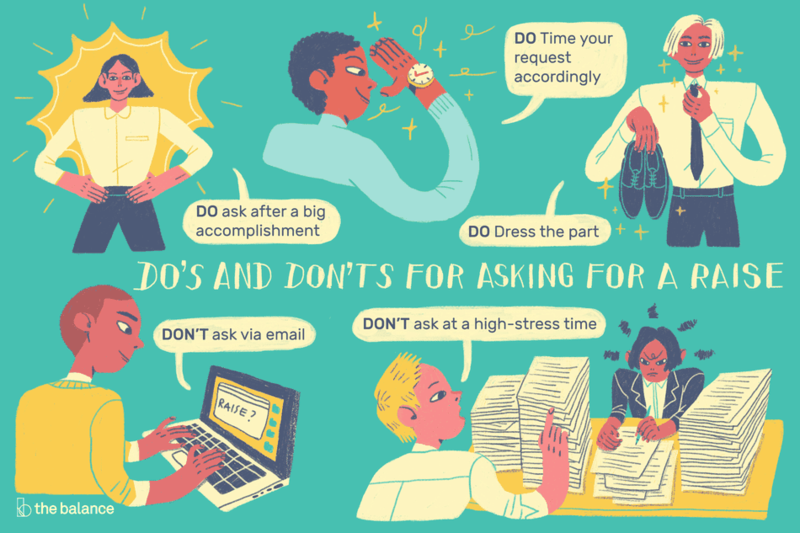 You’ll probably want to avoid framing it in a way that sounds like a demand—“I need this raise, or else!”—as you should try to stay on good terms with your boss even if they say no. 9. Don’t use information about colleagues salaries as a reason why you should get a raise. Avoid bringing in office gossip to your discussion. Even if you know someone makes more money than you and you think that you deserve a salary that’s equal—or higher—it’s advisable to keep that kind of private information out of your conversation. It’s just not professional, and you never know if what you’ve heard, or overheard, is true. Instead, focus on your own individual experience and accomplishments and why you should get a raise in regards to your own merits, not based on what other people are getting paid. 10. Don’t supply too much personal information. Ideally, you should try to craft your proposal in a way that focuses on the reasons why you deserve an increase in salary, rather than why you might need one. There are some things that are better left unsaid when you're talking about a pay increase. Unless you have an exceptionally familiar relationship with your supervisor, it’s a good idea to avoid citing personal reasons, like if your spouse lost his or her job, if you’re sending another child to college, or if an investment went bad, and instead keep the emphasis on what you’ve done to merit a raise. Even though you really want to know right away, don't expect an immediate answer. Unless you're at a very small company, your manager may not even have the authority to give you a pay raise even if they want to. It will probably need to be discussed with Human Resources and/or other company managers. Don't feel badly if your request is turned down. There simply may not be money in the budget for pay increases, regardless of how well deserved your raise may be. Many companies have formal company policies that determine salaries and pay raises, so there may not be flexibility to give you a raise other than when you are eligible for one under company guidelines.